WebRTC has seen traction in its adoption within new and important applications, and by key tech leaders and other businesses. If you know anything about the real-time communications technology WebRTC, you probably already know Google has been its key champion. And Google uses the technology in various areas. (Although, it should be noted that Google’s Chrome 57 release has been causing some headaches on this front, as GitHub conversations indicate many people have experienced WebRTC errors on Chrome 57). However, Google is most certainly not the only tech giant bolstering WebRTC. Just last month, Microsoft added support for WebRTC in its Edge browser. And Snapchat employs WebRTC in its video calling feature, Chad Hart, head of strategic products at Voxbone, noted in a 2016 blog. 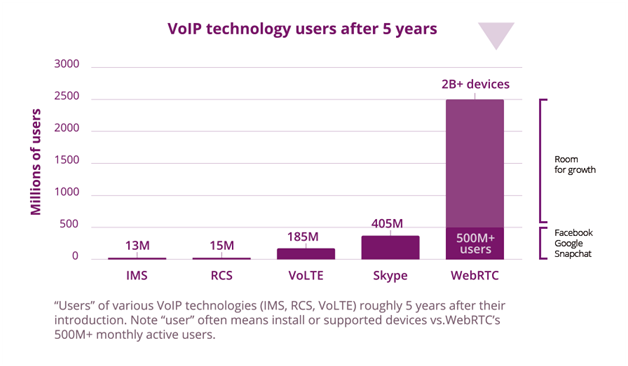 Hart of Voxbone went further yet in emphasizing the advancement WebRTC has made with his comment that “WebRTC is doing far better than any other previous VoIP technology at the five-year mark.” In this case, he was comparing WebRTC to IMS, RCS, VoLTE, and Skype. (See his chart below).